In the 58 years between Menzies’ 1949 election win and Howard’s 2007 departure, only two prime ministers were deposed by party room revolts. In the past 11 years, four sitting Prime Ministers have been deposed by their own party’s MPs. Many commentators have tried to explain this instability by focussing on the emergence of social media or the 24-hour news cycle. But the causes of it are much deeper. There has been a long process of the major political parties becoming increasingly detached from their traditional supporters, which has driven their primary vote down. This process has been underpinned by the crisis of profitability in capitalism that began in the 1970s and remains unresolved, with its most recent outburst in the 2007 global financial crisis. In order to deal with the crisis and boost profits, both Labor and the Liberals have embraced neo-liberalism, hacking away at workers’ rights and the welfare state through privatisation, financial deregulation and austerity. After the Second World War there was a broad consensus on the need for state intervention in the economy and expanding welfare services. The Whitlam government elected in 1972 was the high point of this. But after the 1973 oil crisis the post-war boom fell apart. To defend the bosses’ profits, Whitlam moved to make workers pay for the crisis and began implementing cuts. This helped demoralise Labor’s working class supporters. After Whitlam’s sacking in 1975, Labor’s primary vote dipped to a low of 40 per cent. After a few years of Malcolm Fraser, Labor’s primary vote went to 50 per cent when Bob Hawke was elected in 1983. But that was its peak. Hawke and Keating set about implementing neo-liberal policies, deregulating the financial sector and privatising state-owned companies in telecommunications, banking and airlines. They were able to co-opt the trade union leadership into collaboration through the Prices and Incomes Accord, which promised improvements in the “social wage” (welfare benefits and government services) in return for unions accepting low wage increases and restricting strikes. The Accord was a disaster for the working class. Real wages for factory workers dropped by around $100 per week between 1983 and 1996. After 13 years of Labor’s neo-liberalism, a section of the working class deserted the party in 1996 and voted for John Howard. Despite his 11 years of electoral success, public opinion on many issues was to the left of Howard. In 1996, 57 per cent preferred personal tax cuts compared to 17 per cent who wanted an increase in social spending. By 2005 that had changed to 47 per cent support for more spending as opposed to 34 per cent support for tax cuts. But Howard kept on winning elections for 11 years because Labor was so badly damaged by their record in the 1980s and 1990s, and the party remained wedded to neo-liberalism. Yet when Howard over-reached with his massive attack on workers through WorkChoices, the unions stirred into action with the Your Rights at Work campaign that drove Howard out of office. The Labor Party was established by the trade union leaders in the 1890s, and union members have always been a key base of support for the party. But Labor’s Accord with the unions in the 1980s undermined rank-and-file militancy. To enforce the Accord, the Hawke government ruthlessly smashed unions, like the Builders Labourers Federation and the pilots’ union that sought improved wages or conditions outside it. Workers were alienated from the Labor Party and union membership fell from historic highs of over 60 per cent to below 15 per cent today. This has contributed to the decline in rusted-on Labor voters. Its primary vote has declined from an average of just under 50 per cent, to mostly hover around 35 per cent now. The LNP primary vote has also fallen in that period, but not as dramatically. But its membership has halved since the 1950s. The Liberal Party has always been the party of big capitalists in Australia and ruled in their interests. But it also depends on a wider base in order to win elections. Even among Liberal voters neo-liberalism is deeply unpopular. For example 40 per cent of Liberal voters in WA opposed Colin Barnett’s planned power privatisation, costing him the state election. Academic Peter Mair has called these general trends “the hollowing out of democracy”, pointing to a process that is going on across the developed world. It is marked by a decline in engagement in official politics; a decline in party identification and affiliation; declining voter turnout and rising electoral volatility; and the fact that major parties have converged in terms of policies. This is borne out in the trends in Australian political survey data. In 1967, 72 per cent of people claimed to always vote for the same party. By 2016, this was down to 40 per cent. Only one-quarter to one-third of voters believe there is “a good deal of difference” between the ALP and the Coalition. That sums up the crisis of social democracy and political representation—workers can’t see a party that represents their class interests. As parties are more and more detached from a base in the real world, parliamentary parties are more consumed with opinion polls and the opinions of focus groups as they chase swinging voters. It is this that accounts for the high turnover of party leaders in the hope of improving their electoral chances. Meanwhile the vote for minor parties, The Greens on the left, and parties like One Nation on the right, has been growing and is approaching a third of the electorate. Because of the nature of the Australian electoral system, support for minor parties is mainly expressed in the Senate. This has increased the difficulty of passing legislation, which also contributes to the view that the ruling party can’t control parliament. In Europe, where the economic crisis has been much deeper, the ruling class has required much deeper cuts in government spending, and traditional Labor-type parties have done their bidding. This has led to further political polarisation that had fed the growth of the far right, but also the rise of radical left reformist parties like Syriza in Greece, Podemos in Spain and Melenchon in France. In Britain, this dissatisfaction has found expression in the Labour party with the rise of left-wing leader, Jeremy Corbyn. In ten days in 2016, 100,000 new members join the party, as membership surged past 500,000. The Rudd-Gillard-Rudd and the Abbott and Turnbull governments have all governed in the interests of big business. Kevin Rudd was elected in 2007 on the back of the unions’ Your Rights at Work campaign. Initially he distanced himself from Howard’s policies, particularly on climate change, refugees and indigenous people, sending his popularity through the roof. But there was a huge contradiction between his rhetoric and what he was willing to deliver. Rudd did not break with the neo-liberalism of Howard or Hawke and Keating and proudly boasted that he was a fiscal conservative. He kept most of the anti-worker laws previous governments had introduced, further alienating the working class vote. When he dropped his emissions trading scheme, he totally lost credibility—and a million voters in a fortnight. He had spent a year and a half promoting the policy and the need to take action on climate change. But he was not prepared to do anything that might upset business profits, so he first designed a useless scheme, then completely dropped it. Tony Abbott won the 2013 election in a landslide. In his first budget however, he went all guns blazing, with cuts right across the board and attacks on workers’ rights. This was rightly seen as a class war budget and sparked demonstrations up to 30,000 strong. It was massively unpopular, and Abbott was unable to pass much of it through the Senate. The Liberals never recovered. The ruling class despaired at his failure to push through their hated “reform agenda”. Facing electoral defeat, Abbott was knifed by his party. Malcolm Turnbull promoted himself on the basis that he could communicate better and sell the Coalition’s policies to the public. 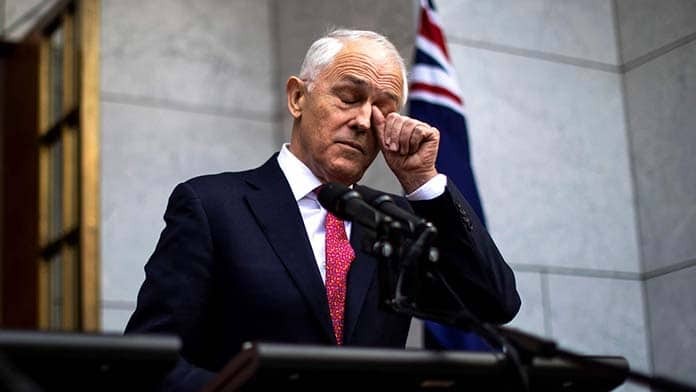 But Turnbull was quickly seen as Abbott-lite as he willingly appeased the right of the Liberal Party and the Nationals. Despite once being an advocate of reducing emissions, he did nothing on climate change. Similarly, he delayed any decision on equal marriage as long as possible, before embracing Peter Dutton’s push for a plebiscite. Like Abbott, Turnbull kept losing the opinion polls to Labor. Meanwhile, marriage equality won the support of 61.6 per cent of the population. And an Australia Institute poll this month found growing concern about climate change, with 67 per cent wanting coal power phased out within 20 years. Turnbull’s very narrow election win in 2016 further weakened his authority. His signature policy of corporate tax cuts was hugely unpopular. His defence of the big banks also isolated him. Eventually the right-wing of the Liberals moved against him. But the Liberals’ commitment to anti-union laws and cuts to public spending won’t change. The first poll after Morrison became Prime Minister had Labor even further in front. The next government is likely to be Labor. Bill Shorten has tacked to the left in an effort to tap into the disgust with the Liberals. But Labor remains committed to the neo-liberal policies that the capitalist system needs to keep profits flowing. The crisis in political representation is set to continue. That means there’s likely to be more instability in the political system in the period ahead. The danger is that Labor’s failure will again create the disaffection that allows racism to grow and opinions to be pulled to the right. Two things are needed in the period ahead. The first is struggle to build the fight against the Liberals, and to rebuild the industrial strength and militancy of the unions. The second is socialist organisation that can begin to really represent the interests of the working class and link every struggle into a fight against the capitalist system.